Situated in the northern part of the Cyclades, Andros is a very popular holiday destination, as it is close to Athens and easily accessed from the port of Rafina in Attica. This is a very beautiful island with gorgeous alternating landscape of mountains, deep gorges, clear springs and green-clad valleys. 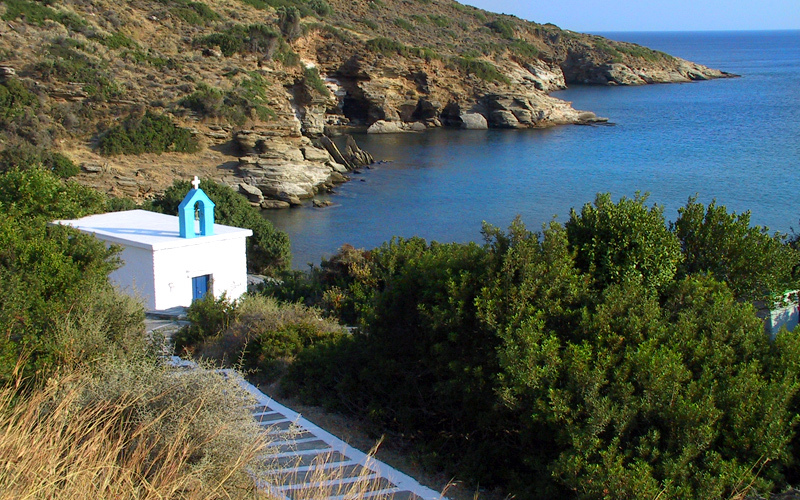 Due to its verdant mountainous setting, Andros is ideal for trekking and other eco-tourism activities. Trekking in Andros includes walking through forests, get on top of mountain ridges, explore picturesque villages, dotted all around, and visit rivers and magical waterfalls. Trekking enthusiasts are suggested to stay in one of the comfortable apartments in Andros Chora and start their walking ventures from there. Hikers and trekkers are offered a great variety of different landscapes to discover on Andros, with many sights along the way; old bridges, valleys, watermills, monasteries stone-walled paths and marvellous beaches. In the regions of Achla, Vori and Pythara tourists can enjoy strolling beside flowing streams and in Palepolis they can explore the ancient site. Numerous trails of varying difficulty can be found, giving the chance to both experienced and novice walkers to enjoy trekking in Andros. There is an entire network of trails, many of them officially signposted and cleared, mainly in the south-eastern part of the island. 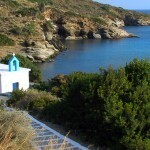 Most hiking paths are easily accessed at first, as they depart from or arrive in Chora, the capital and main settlement of Andros, where you can have your accommodation base. The best time to go on hiking or trekking in Andros is spring and early summer, when temperatures and mild and nature is at its best. The streams are abundantly flowing, trees and flowers are in full bloom and the mountains are verdant. Some of the most popular routes guided by signs with numbers for each path, start from Chora and include the wonderful green villages of Menites, Messaria, the gorge and valleys of Dipotamata and the celebrated Monastery of Panachrantou. Other trails pass the waterfall of Pithara, the beautiful Sineti village and the settlements of Korthi and Vourkoti. Specifically, the two most famous trekking trails are number 1, which starts from Chora and ends at Monastery of Panachrantou, and number 2, beginning in Ano Aprovatou leading back to Chora.